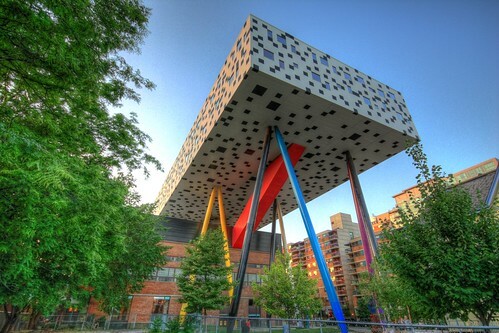 Toronto boasts of a bizarre building on stilts. 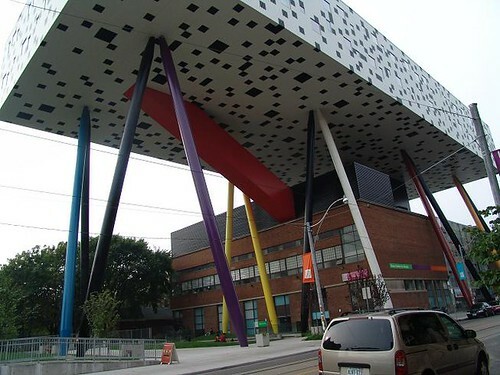 Sharp Centre for Design - an extension of Ontario College of Art and Design, Toronto Canada is perched 26 metres above the ground supported on 12 slanting stilts which look like extra large sized crayon pencils. 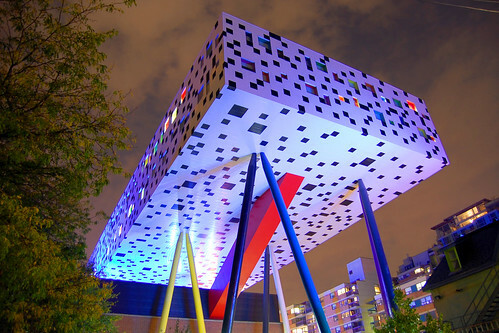 Completed in 2004 the building was designed by architect Will Alsop. 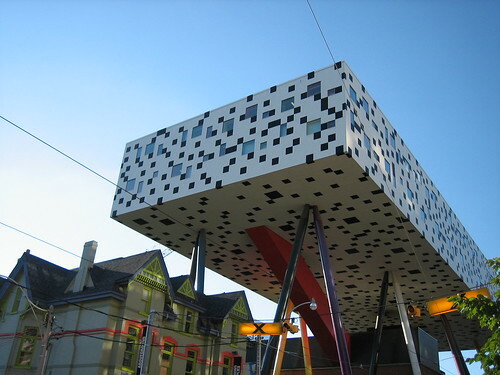 The box shape building is 82.3 metres (270 feet) long, 30.5 metres (100 feet) wide and has two floors of classrooms, studios, and offices. Out of 12 slanting stilts, five are painted black to give an illusion of slenderness, especially at night when the black legs seem to disappear. 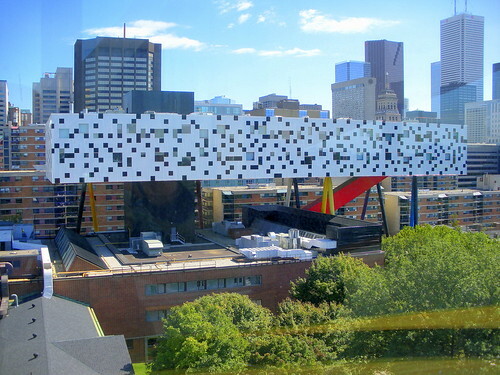 The exterior is clad with white corrugated metal and decorated with black squares like crossword puzzle. 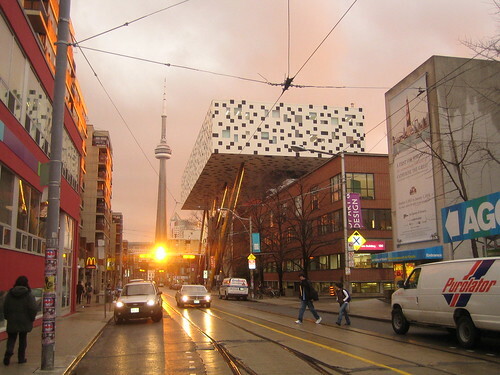 The building was originally planned at the nearby parking lot but had to be raised above the ground due to objection by neighbourhood. 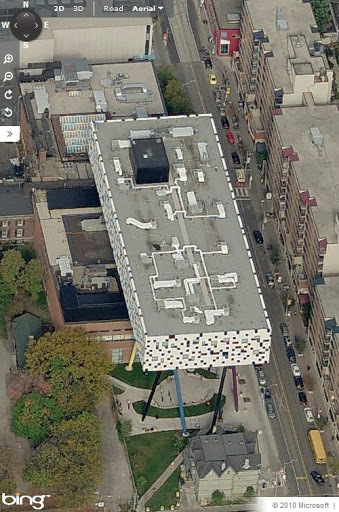 It now hovers partly over the parking lot and the existing building of OCAD. 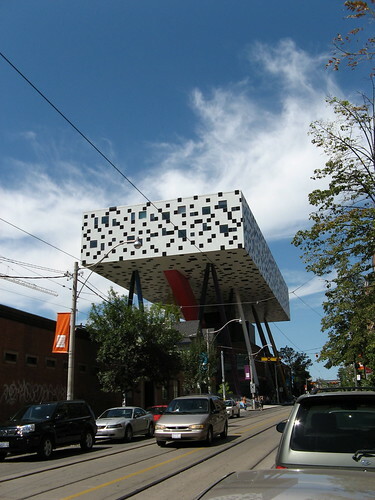 The building has received numerous awards, including the first-ever Royal Institute of British Architects Worldwide Award, the award of excellence in the "Building in Context" category at the Toronto Architecture and Urban Design Awards, and was deemed the most outstanding technical project overall in the 2005 Canadian Consulting Engineering Awards. The locals often refer to the building as 'Table Top'.